Cullen worked with the contest winners to film short videos highlighting NASA spinoff technologies. Students visiting NASA’s Goddard Space Flight Center in Greenbelt, Md., experienced a touch of science and Hollywood on Thursday, April 24. The students visited the center not just to celebrate their winning the recent OPTIMUS PRIME Spinoff Video Contest, but also to raise awareness of NASA technology spinoffs being used in different industries. The contest itself, developed by the Innovative Technology Partnerships Office (ITPO), challenged students across the country—the contest winners came from Maryland, Tennessee and Florida—to highlight NASA technology spinoffs by creating original videos. As part of the contest, ITPO worked with Omniangle Technologies LLC to invite the seven students—ranging from elementary to high school—to visit the center and take their winning videos one step further. During their two-day visit, the students highlighted NASA Goddard spinoff technologies in videos they wrote and produced in the center’s television studios. The videos may be featured on NASA’s official television channel, NASA TV, later this year. In addition to working with NASA Goddard’s production crew, the students had a very special guest. 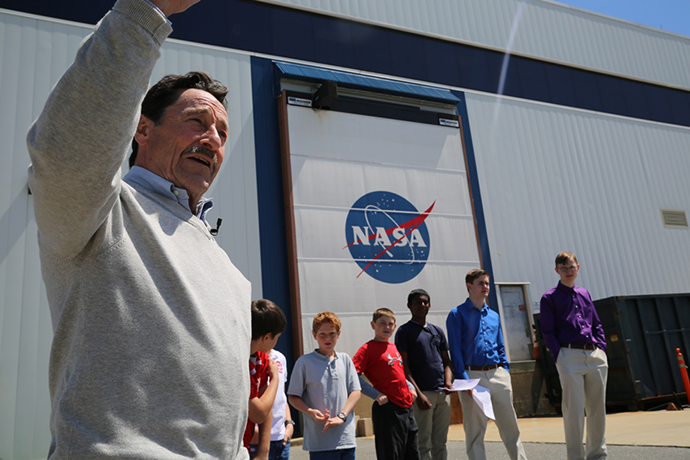 Peter Cullen, the voice of the OPTIMUS PRIME character from “Transformers,” worked with the students on their videos and discussed their one day playing a role in fulfilling NASA’s mission. The contest winners were acknowledged all over Goddard, including by Center Director Chris Scolese (far right). Although the students were hard at work making their videos, their time at the center wasn’t limited to the studio. They explored different parts of Goddard, including the Satellite Servicing Capabilities Office robotics lab. In addition, the students toured the environmental test facilities building, where satellites and instruments are tested before being launched into space. The students also had the chance to meet several of the center’s most notable scientists. In addition to a talk with Sciences and Exploration deputy director and former NASA astronaut Piers Sellers, the students also spoke with astronomer Michelle Thaller and physics Nobel laureate John Mather. The event was an opportunity to get the winning students more excited about NASA technologies and career opportunities. 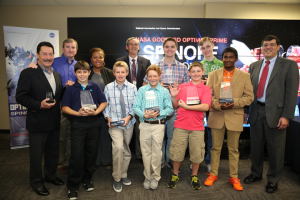 By creating their own videos, the students’ accomplishments also served to further educate the public about NASA spinoff technologies. “The creativity and skill demonstrated in each of the students’ videos shows their understanding of how NASA technologies are used in space applications, as well as industries such as environmental, medical, and manufacturing here on Earth,” ITPO chief Nona Cheeks said.